Emotional motivators are the strongest drivers of customer behavior, such as purchasing, paying higher prices, and remaining loyal. A top-10 financial institution is using emotional connection to unlock cross-sell opportunities. A leading food brand is using emotional connection to drive purchases and capture market share. And an enterprise technology firm is using emotional connection to counter “white box” competition and support higher price points. In each of these examples, CFOs are playing key roles in leading their enterprises to focus on emotional connection as the key performance indicator to drive growth and prioritize customer-facing investments for bottom line contribution. What is emotional connection? Emotional connection means a customer connects her deepest emotional motivators to your business. Rather than buy from you primarily because you have good products, helpful salespeople, or a well-known brand, emotionally connected customers do business with you because you also help them achieve social acceptance and a sense of belonging, feel better about their careers, simplify their complex lives, or give them confidence in their futures. Emotional motivators are the strongest drivers of customer behavior, such as purchasing, paying higher prices, and remaining loyal. The following is an extended example of a company employing this metric. The CFO of a U.S. retailer led his firm to measure and prioritize “emotional connection” with customers. 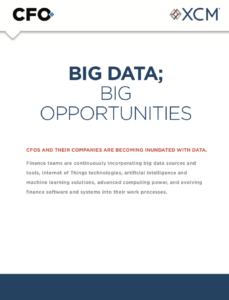 By focusing on emotional connection, this CFO helped his business return to profitable growth, measure the contributions of marketing, innovation, and customer experience investments on the bottom line, and transcend data overload to deliver critical intelligence driving the business. Two years earlier, the retailer’s board and CEO had asked the CFO to assume expanded duties in strategy and analytics. Revenue growth was tepid, margins were under pressure, and the CFO knew the firm’s strategy combining cost-cutting and using cash to repurchase shares and grow dividends would not maximize shareholder value long-term. M&A valuations were (and remain) too lofty, and the CFO knew success rates for acquisitions in the category were low. Working with his C-suite counterparts, the CFO believed growing customer value would be the most important driver of profitable growth. The business needed a repeatable formula to acquire valuable new customers, keep them longer, and capture a larger share-of-wallet from them. Unpacking current customer value was eye-opening. Average spend by customers was declining. The company was losing share-of-wallet. Customer tenure was ticking down, as the company was churning millions of customers. 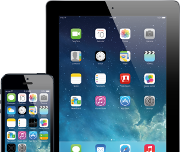 Among new customers, a growing number were completing only one purchase. All the while, acquisition costs were increasing, as the company found it harder to win new customers in the hyper-competitive marketplace. The CFO knew the ratio “lifetime value-to-acquisition and engagement costs” — then declining – would have to reverse course for profitable growth to ensue. To his surprise, the CFO learned that while customer value was declining, the firm’s customer satisfaction and brand consideration scores were actually near all-time highs. Net Promoter scores had increased significantly in recent years, too. Further, the firm was investing heavily in omni-channel experiences and product innovations without customer value gains. The CFO concluded: The firm would need to go beyond these traditional strategies to accelerate customer value, and in turn, profitable growth. The CFO posited a fundamental question to the C-suite: What’s really motivating customers and how does the business regain control of customer value? The concept of emotional connection had been introduced to the C-Suite in past years by the chief marketing officer, but only in the context of creating advertising with an emotional resonance. The CFO understood that customers’ profitable behaviors were mostly driven by emotion, and he hypothesized the potential of emotional connection to grow customer value. Working with his analytics team, this hypothesis was validated: When customers became emotionally connected to the business, customer value increased dramatically — 50% to 100% depending on the segment. 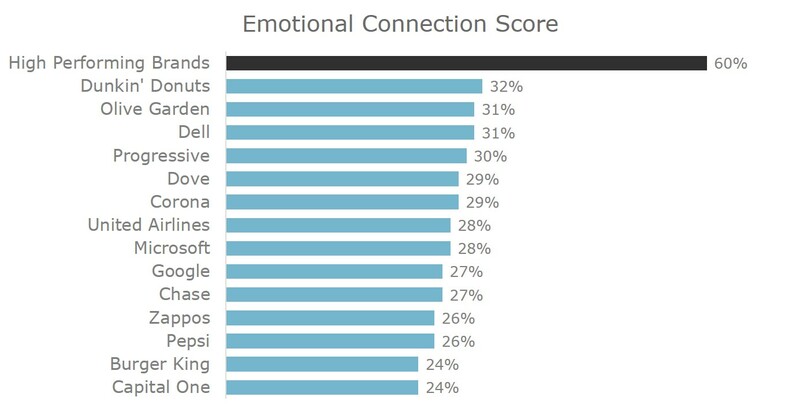 The percentage of each brand’s customers that are emotionally connected, based on predictive intelligence data from Motista. By measuring and growing emotional connection, the retailer could reverse negative customer value trends and renew profitable growth. The CFO realized that investments across the business — not just marketing, but also omni-channel, product innovation, and real estate — could be focused to grow emotional connection. At the outset, the CFO and his team established measures of emotional connection for the business overall and across segments. Using predictive analytics, emotional connection was tied to customer financial data, including spend and margin, tenure, and lifetime value. The CFO helped the enterprise understand where the business was strong and weak. Early on, the CFO presented a business case to the CEO and board — by focusing existing operating and capital expenditures on emotional connection, the firm could accelerate profitable growth, return on capital, and ensuing shareholder value. From here, the CFO partnered with his counterparts in marketing, omni-channel, real estate, and product to begin executing on emotional connection. Historically, in acquiring new customers, the retailer had cast a wide net across demographic and psychographic segments, tolerated high churn, and captured a small number of loyalists each year. This was a low ROC formula, and all too common in retail. The CFO’s analytics team, partnering with marketing, developed a new, high-ROC acquisition model. New customers could be targeted and engaged based on “emotional predisposition.” These are consumers more likely to connect their emotional motivations to the category, and in turn, spend more. The retailer now knew “why” the most valuable customers were so valuable and rather than “play the odds” could focus on acquiring and monetizing these customers. The marketing team identified emotional target consumers on national databases, search engines, and digital properties. Emotional messaging was used to engage these customers, and the results were impressive. While conversion rates rose about 10%, customer value skyrocketed. Rolling customer spend at six and twelve months was 40% and 75% higher than norms, respectively. And twice as many emotional target customers converted into loyalists. The CFO and CMO were equally focused on expanding the value of existing customers. On CRM, both active and inactive customers with emotional predisposition were prioritized, targeted, and engaged with emotional messaging, leading to significant gains in share-of-wallet and tenure. The CFO quickly realized the knowledge of customers with emotional predisposition would benefit store investments. Existing stores with high concentrations of these customers performed better. In-market tests, initially at 20 new stores, then 100, yielded stores with higher sales-per-square-foot, faster attainment of break-even, and higher ROCs. Even before focusing on emotional connection, the CFO had sought to prioritize omni-channel investments based on bottom line contribution. Emotional connection — predictive of financial value — proved very helpful here. 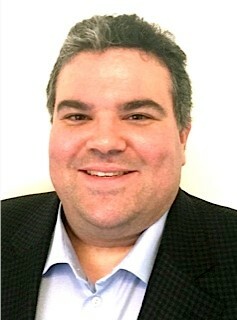 The CFO and his analytics team determined how each omni-channel touch point — across dozens spanning in-store, e-commerce, mobile, and social — impacted emotional connection. Emotional connection became a filter for prioritizing omni-channel investments. Today, the retailer measures its emotional connection on an ongoing basis, enabling continuous improvement cycles. Emotional connection is a cross-enterprise KPI used to predict customer value, prioritize store locations, and filter omni-channel and product investments. The CFO’s focus on emotional connection and the actionable intelligence his team provided the business has directly contributed to profitable growth and higher ROCs.